The Selinda Trail is a real adventure experience done in fully backed-up style as either a combined canoeing/walking option, or as a pure walking safari experience. The activities on offer are dependent on the ebb and flow of the waters. So chart a course along the Selinda Spillway in northern Botswana as in the days of old. Embarking on foot or by canoe on the first afternoon quickly creates a real sense of wildness. On the pure walking option we cover around 20km’s over the entire route. The canoeing covers a longer distance of 40 km’s route over 4 days. Every trip begins with a thrilling helicopter flight from the airstrip to the start point. Flood waters in Botswana in 2009, along with some subtle tectonic shifts, caused the water to pour into channels that had been dry for years. This allowed a rare first – canoeing on the Selinda Spillway. Since then the waters have receded somewhat, but still there are opportunities to canoe now and again. But our walking is an amazing, exclusive guided adventure to areas not normally visited on the famous reserve. 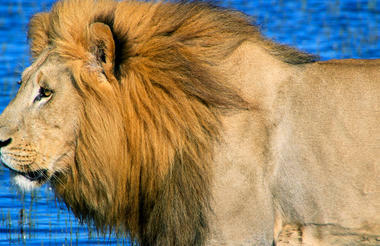 The 320 000 acre private Selinda Reserve is an excellent spot for wildlife. Species include elephant, buffalo, sable and roan antelope and African painted wild dog. The canoe trail covers a distance 40 km’s, and is easy. We stop off for impromptu explorations along the shoreline on foot. On walking only trails we cover around 20 km’s. Evenings are the time for a little relaxation under the stars. Camp set-up is done by the back up team on one of the Spillway’s islands. Meals are freshly cooked and served around the camp fire. When is the best time to do the canoe trail? April to early October – weekly set departures. Max. 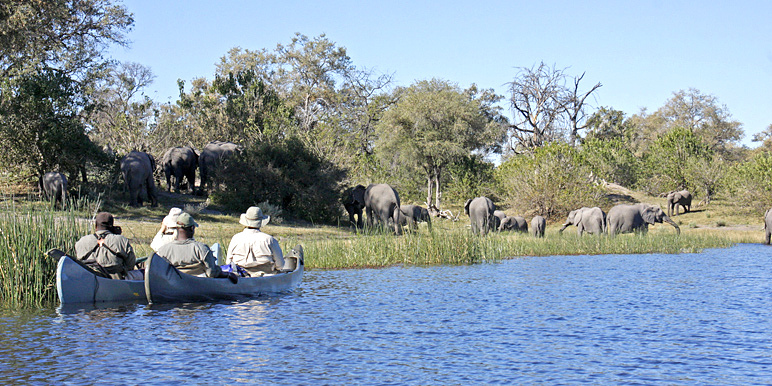 8 guests canoe with our experienced guide. 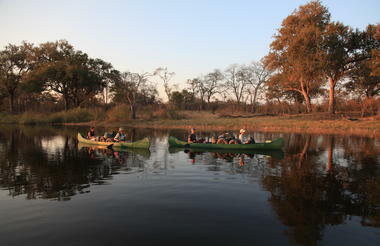 Extend the canoe trail and stay at the one of the two permanent tented camps on the Selinda Reserve. 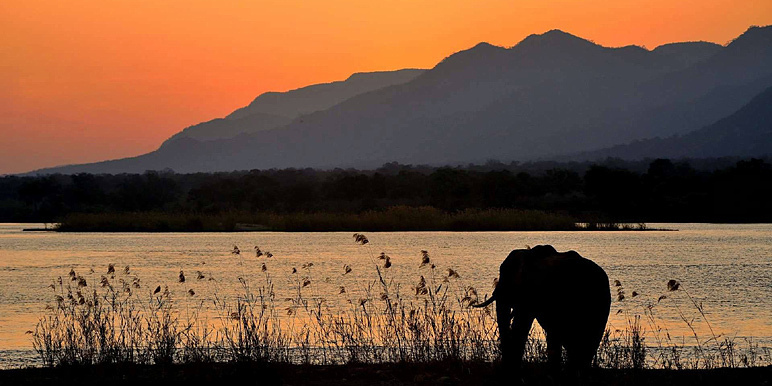 For an exciting alternative see the Mana Pools Explorer For more canoe safari options look at the lower Zambezi Valley For more walking safari options see our Walk through Hwange safari. 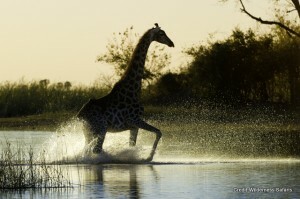 A rare and extraordinary adventure trail along the Selinda Spillway in northern Botswana. Dependent on the ebb and flow of the flood waters, the trail is either purely walking or a combination of paddle and walk. The canoeing section covers 40 km's of easy canoeing. On the walk we cover a distance of 20 km's. Fish and animals are in abundance, vegetation is lush and green and the sheer excitement of the arrival of life-giving water is infectious. The area is home to elephant, buffalo, roan and sable antelope and African painted wild dog. Spend days on the water and evenings under the stars around the camp fire. 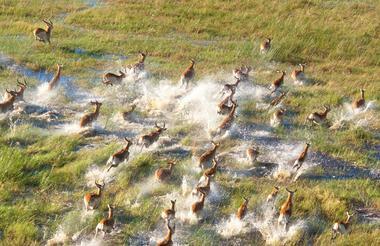 One of the finest experiences and a true highlight for any explorer - the only experience of this kind in Botswana! You'll be met at the airstrip mid-afternoon, followed by a helicopter transfer to a remote point on the Selinda Spillway. Receive a safely briefing, then a short, late-afternoon canoe to camp. We explore the maze of back channels and smaller island. Viewing antelope, large herds of elephant and buffalo, a humbling experience on foot. The length of day is tailored to you. Camp awaits. Up again for early breakfast before we continue along the water course by canoe for another full-day excursion before arriving in camp for the last night of this trail. We head out after breakfast, aiming to finish around mid-morning at Selinda Explorers Camp for a celebratory drink. 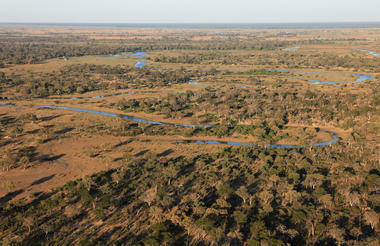 We will then be transferred by road to the Selinda Airstrip, for our final farewell. On the canoe safari, each canoe will have two guests, their bed rolls and bags. Participants paddle their own canoes or walk to their camp site each day. No previous paddling or canoeing experience is needed as tuition will be given – but participants must be fit enough to paddle their own canoes. 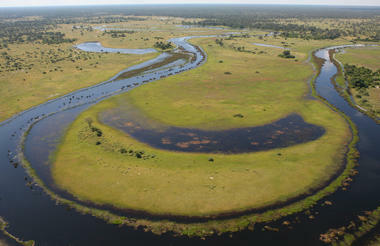 northern Botswana, in areas where you will be completely removed from the modern world. We will be carrying all of the equipment on the canoes with us. Your camp sites will be of a rustic but comfortable nature. Walk in 3m x 2.4m Flex-Bow tents are provided as they are comfortable and large enough for two people. They are furnished with comfortable bedrolls and quality linen. 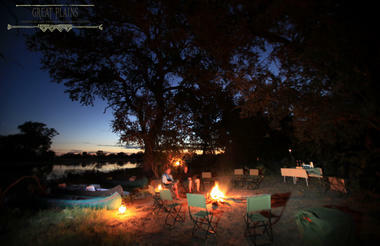 We provide enough camp chairs for dinners at a well appointed dinner table and for guests to sit around a fire at night. 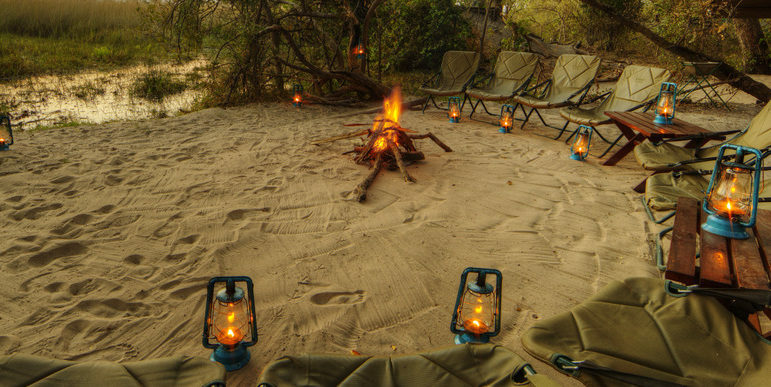 Our meals will be prepared on the fire by the cook, enhancing that safari atmosphere of old experience. accommodation before or after the safari. the dress code on this safari is very informal, we recommend that you take the minimum possible.  It is highly recommended that comfortable and suitable walking shoes/boots, and a pair of strops/rafting shoes or “Crocs” are brought on this safari. Additional luggage can be collected off you at the Selinda Airstrip and stored for you, for your return. Please bring your own high quality binoculars and camera equipment to enhance the enjoyment. Waterproof camera bags are strongly recommended. Scheduled flight to Maun and then by private charter to Selinda airstrip. Please ensure that your departure flight from Maun, Kasane or Victoria Falls is booked for after 14h00 if your regional or private charter flight back home is on the last day of this safari. Along the routes we expect to come across many species of wildlife. The Selinda Reserve is well known for some of Botswana’s largest herds of buffalo and elephant, roan antelope and African wild dog. Other possible sightings include cheetah, lion, leopard and variety of other species. It is also a birder’s paradise with over 300 species possibly seen.